A couple of days ago I got another chance at my sub-50:00 10k time. The occasion was the 2012 British 10k, and this day I was not to be denied my goal. The day started with a very early wake-up as my friend Melissa had strongly advised me that a key to this race was an early arrival. They don't have starting pens arranged by projected finish time, everyone just gathers in one mass and starts in no particular order. If you are too far back you can spend the whole race just trying to get around a field of walkers and slow runners. So I got myself out of the house and on the way to arrive shortly before 8:00 when the bag drop opened. As I left the house I was greeted by proper British weather: cold, grey, wet. Significantly better running conditions than the baking weather we had had for my last race. A quick bus and tube ride got me to the bag drop, where I dropped off my bag of warm clothes, and headed straight for the start line. About half a kilometer from the start was a rope where we were to be held until just before the start of the race. I was one of the first twenty people there, and was standing right next to the rope. A good payback for the early rising. Also following Melissa's advice I had brought a bin liner with me so that when the rain became heavier I could keep myself mostly dry. While waiting I had some good chats with the runners around me. Mostly other people trying for a fast time and wanting to avoid the crowded start. Finally the stewards starting moving us towards the start. Our route would take us past the start on the opposite side of the street, then do a U-turn to end up just before the line. Right at the start was an open-top double-decker bus with the race announcer doing thinks like interviewing celebrities. And as we came down who was being interviewed: Charlie Dark! Founder of Run Dem Crew. Woo hoo! I caught his eye with a gun-finger (an RDC tradition) and got a big double-gunfinger back! A very cool moment. When we finally fetched up near the start we could see a bit of clear space and a whole bunch of VIP runners ahead of us. I immediately realised that these were the international urban running crews who had all come in to London for a Bridge the Gap weekend. Hosted by Run Dem Crew! Thanks to Nike we were able to have representatives from ten different countries on hand to represent urban running in this race. Bridge the Gap (the name is in part an homage to the original urban running crew The NYC Bridgerunners) is the name we give when we assemble representatives from urban running crews in different countries in one place to hang out, party, and run a race. 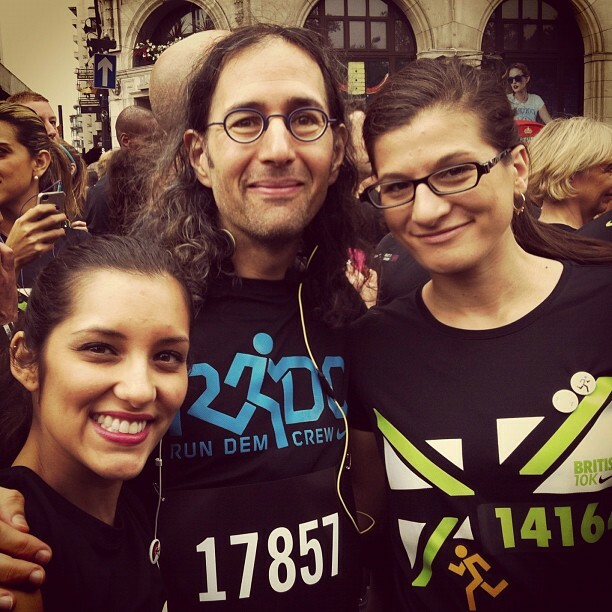 The first even was the Berlin Half-Marathon earlier this year (which I was not able to attend). The next event will be in Amsterdam in October (when I will be running the Amsterdam Marathon). In addition to the race being a big part of the Bridge The Gap weekend, this was also the graduation race for the current crop of Run Dem Crew Youngers. This is a program that does a 'couch to finish line' training program to take young people and use running to teach them to positively channel their energy, reach a goal, and learn to have more belief in their own abilities. A lot of these young people really have a lot of obstacles to success in their lives, and it is amazing to see the time and energy that people in Run Dem Crew put into helping them all take this big step towards personal success. A lot of people were running this race just to be there to help one of the Youngers reach their personal goal. Every single one of these people, the Youngers and the people running with them, accomplished something in this race that is much bigger, and much more important, than my just turning up on the day and running a decent race. I was close enough to the front that I was able to wriggle forward and join the Run Dem Crew contingent. Which is where this picture was taken of me with a couple of the real heroes of the day. Both of these wonderful women ran with Youngers and really made a difference on the day (and thanks to Jackie for the fabulous photo). Finally we had the National Anthem (I think I did a better job of singing along than at least some of the members of the English football team during Euro 2012! ), and then it was race time! I was pumped full of adrenaline and took off quite fast, but gradually dialed it back to my planned race pace of a little under 5:00/km (8:00/mile). I spent a bit of time running with Algy and one of the Youngers, and then realised that they were dropping their pace a bit so I had to get moving to make my time. Which is one of the ways in which the people pacing today totally rocked. There I was thinking about my time, and they were all just focused on helping someone else along. I'm already making plans for one of my upcoming races to be one of those people who commits the race to someone other than themself. The course is fairly tough as you have a few hills, and you have a few places where you actually have to do a U-turn. And of course you lose some time whenever you reverse direction. On the plus side, this means that you pass by either those behind you, or those ahead of you, at several points during the race. This meant that I got to high-five Nathaniel at one point, and give shout-outs to Shameek and many others from my RDC family. At one point I lost a little silly time because I looked down and saw that my timing chip had come unstuck (it's supposed to be stickered into a circle). No sticky stuff left, so I had to just tighten down the velcro on my VFF and hope for the best. Fortunately it did stay in place for the rest of the race. Phew! At around 2.5 km, and again around 7 km I went by the Run Dem Crew supporters section. What a fantastic group! Waving signs (and even had RDC banners hanging off of one of the bridges), ringing cowbells, yelling, high-fiving. Big lift from these guys. Special thanks to Paul and Clare, big big props to all of you. I just didn't have time to figure out who everybody else was as I went by. After the second time past the supporters it was uphill a bit to Westminster Bridge, then another U-Turn and on to Parliament and then Whitehall for the finish. I was definitely starting to feel the strain a bit at this point, but big yells from Shameek and Nathaniel up ahead of me really lifted my spirits at this point. I kept thinking I was going to just cruise to the finish, but when I caught sight of the finish line I channeled Melissa and kicked it into high gear and finishing strong. Right after the finish I got lots of love from Charlie Dark and the rest of the fast RDC crew who had finished ahead of me. What a great feeling to congratulate the fast Youngers, and to feel that I had done justice to my RDC shirt. Both my Garmin running watch (a birthday present from my wife's amazing family!!!) and the online Nike+ tracking said that my time was 49:22 which made me very happy. Goal accomplished. I was solidly happy about this time, and then got a very pleasant surprise. I received a text with my official race time and it was 49:16! Woo hoo! Of course I want to do better next time, but for now I am just thrilled to have done so well. And even more thrilled that all of the Youngers finished the race, and some of them had amazing times (yes, Michael, I'm talking about you here!! Well done mate). That's it for short races for me this year. Next up, in two weeks, is a fun race called the Down Tow Up Flow Half Marathon along the Thames from Windsor to Marlow. After that it will be all about long runs and prep for my big October. This page contains a single entry by Daniel Maskit published on July 11, 2012 9:40 AM. The Art of Not Training was the previous entry in this blog. Muddy to Marlow is the next entry in this blog.